The Henry Silver Eagle is based on the engraved scroll and silver plated Serial Number 9 Henry Rifle presented to US Secretary of the Navy Gideon Welles by The New Haven Arms Company. Welles served under President Lincoln, distinguished himself as a political leader nationally, and was one of the organizers of the Republican Party. Secretary Welles was also instrumental in the creation of the Navy's Medal of Honor. Using original photos and hand drawings of the Gideon Welles Serial Number 9 as reference, the master plate used in the creation of the new Silver Eagle pattern was hand cut for production with full coverage on both sides of the receiver cover. The Silver Eagle pattern, like the Henry Rifle itself, is one piece of American history without rival. This model is built on the award winning Henry Golden Boy platform. 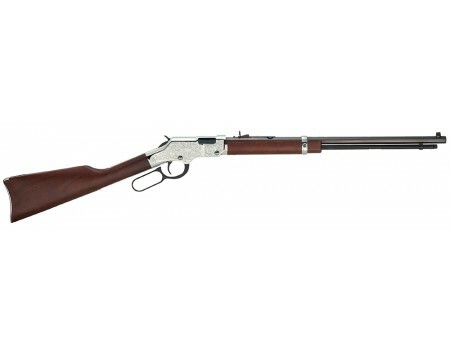 The rifle features a traditional 20 inch octagonal barrel outfitted with buckhorn sights; a gunsmithing masterpiece that closely mirrors its legendary predecessors, the original Henrys when they were patented in 1860. This gun is everything I wished for and more. Quality, Beauty, Craftsmanship in one. I will scope this beauty soon then really have some fun.